An important Wildlife Collision Prevention Program goal has been to increase public awareness of the issue of wildlife vehicle accidents, and to provide useful information that enables drivers to adjust their driving habits and be safer on the road. A series of radio advertisements have been developed to provide wildlife collision prevention information directly to motorists. The ads have been tailored to provide species specific behavioural information for moose, deer and bighorn sheep in high crash areas and also during fall and winter conditions. Radio ads were aired in the east and west Kootenays from in October 2019, alerting drivers to the hazards of encountering wildlife on the roads in the fall. The ads were heard in Golden, Invermere, Radium Hot Springs, Trail, Castlegar, Creston, Grand Forks, Cranbrook, Kimberley, Fernie and Sparwood. This 30 second ad focuses on raising the awarness of motorists in the east Kootenays to the presence of bighorn sheep on the highways during the winter months. This ad aired in the Revelstoke, Golden, Invermere and Radium Hot Springs area. Sheep move to the valley bottoms during the winter so that they have access to forage that is not covered with as much snow as in higher elevations. Bighorn sheep are also attracted to the road and roadside area by road salt and can often be seen licking the road surface. Bighorn sheep generally bed down at night so the highest risk times for collisions are during the low light hours of dawn and dusk and during the daytime. You can listen to the bighorn sheep radio ad by clicking on the link below. These 30 second ads incorporate regionally specific data from the University of Northern British Columbia research on wildlife collisions. The ads play through central and northern BC in January. Mike Gouchie, a country music recording artist, was involved in a moose collision in July 2007, just south of Prince George. He had previously been in a moose collision several years ago in which his best friend was killed. Mike generously donated his time and talent to record 3 moose collision ads for the series. The message is "Slow down and give wildlife and yourself a brake!" You can listen to the radio ads by clicking on the links below. A major initiative has been to locate informational signs at rest stop areas throughout BC. More installations are planned in northeast BC. Another project has been to place billboards with a safety message in high risk locations on BC's highways. The billboards say: "Watch for Wildlife - Use Caution!" and are intended to remind drivers to pay attention to the more traditional wildlife warning signs on the highway, and to continue to watch out for wildlife on the road. Collision prone areas in the province determined the locations of the billboards, which will be in place during the high risk times of the year. Billboards have been located in several locations throughout BC; west of Dawson Creek; east of Fernie; east of Grand Forks; west of Chase, south of Radium Hot Springs, south of Fairmont Hot Springs and along the Alaska Highway. A local trucking company in Prince George has enlisted the help of some young artists to help remind its drivers about the dangers of moose on the highway. Landtran Logistics manager Brian Stoppler wanted his truckers to get the message with the extra punch that can only be delivered by children. 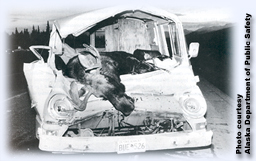 "Our trucks, unfortunately, whack quite a few moose," he said. " I told my wife, (the principal of Pinewood Elementary School,) that we had to do something different, rather than the standard safety sign. Twenty-two kids in the Grade One class worked in pairs and individually to produce 19 paintings featuring moose. Lynda Stoppler, the principal, said her little charges definitely believed the danger faced by drivers and moose alike, and relished their contributions to highway safety. Brian Stoppler said it is impossible to measure the true impact the child's touch will have on the drivers, but "there was a lot of laughter". The paintings run down the hallways from the front entrance at Landtran around into their cargo bays, so the drivers can't miss seeing them. Excerpted from The Prince George Citizen; Friday, March 17, 2006, written by Frank Peebles. Achieving Balance in Transportation: exploring the challenges and successes that transportation organizations encounter in balancing healthy ecosystems and efficient transportation systems. Visit the ICOET conference website for more information. Sessions, panel discussions, workshops, and keynote presentations on safety, mobility, and technology. The interactive program can be found here. Conference Program Book, and Abstracts are available here. Road Watch BC was developed in partnership with Wildsight, Western Transportation Institute, Yellowstone to Yukon Conservation Initiative and the Miistakis Institute to enable citizens living in Elk Valley region of southeastern British Columbia to report wildlife sightings along major highways. Information on wildlife sightings collected by the public will enable a better understanding of where wildlife are commonly crossing, involved in collisions, or moving adjacent to the highway. Ultimately this will lead to development of informed strategies to reduce wildlife vehicle collisions while ensuring the safe passage of wildlife across highways. The RoadWatchBC program is comprised of a smartphone app and associated on-line mapping tool to increase efficiency, accuracy and ease of wildlife sighting data collection, and ultimately generate a dataset to be used to inform strategies to improve road safety for people and reduce wildlife mortality. Road Watch in the Crowsnest Pass was the precursor to RoadWatchBC and initially provided the community the opportunity to report sightings of wildlife crossing Highway 3. The project collected, analyzed and communicated information highlighting crossing locations of wildlife along the highway based on local knowledge and observations. Visit the Road Watch In The Pass website for more information. November 30, 2010 - Watch Out For Moose In December! Copyright © 2004 - 2019 Wildlife Collision Prevention Program All Rights Reserved.